The sloped overpass abutment rests upon weak fill dirt, debris, wood waste and tidal sand, in layers extending 200 feet deep. Crews are working to make the deck a couple of inches higher. 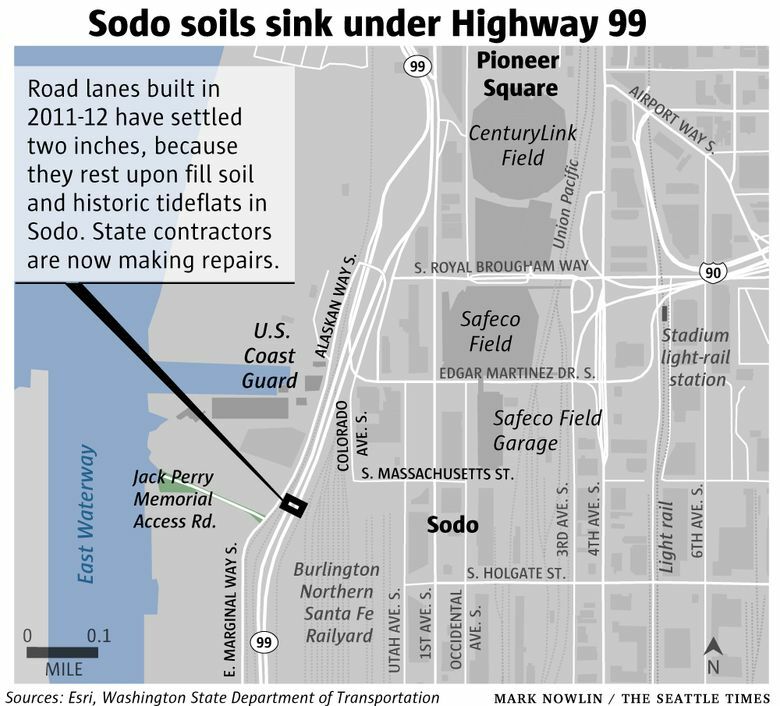 Seattle’s 19th-century zeal to reshape its landscape has come back to haunt drivers on Highway 99, where a modern overpass approach in Sodo settled 2 inches since it opened in 2011. The sloped structure rests upon weak fill dirt, debris, wood waste and tidal sand, in layers extending 200 feet deep. Settlement occurred despite research by soil engineers who profiled and mapped hundreds of core samples, before the state embarked on its $3.3 billion megaproject to replace the Alaskan Way Viaduct with a tunnel. “The challenging nature of fill soils is, they can vary greatly in a short distance,” said Laura Newborn, spokeswoman for the Washington State Department of Transportation (WSDOT). Motorists and bus riders in recent weeks noticed a jolt where contractors removed a pavement strip across the roadway, to prepare the structure for repairs. Crews will add concrete to make the deck a couple of inches higher, then make the vertical barriers slightly taller along the roadway shoulders, Newborn said. The overpass crosses BNSF Railway tracks alongside St. Martin de Porres homeless shelter. Drivers occasionally complained about a droop in the pavement, while the state monitored road levels, Newborn said. This year the ground stabilized, setting the stage for repairs, she said. WSDOT hasn’t yet calculated the cost for repairs that are still underway, said Highway 99 deputy administrator Dave Sowers. But it’s far less than the millions that would have been required in 2011 to drill deep foundation shafts below the abutment, he said. The adjacent overpass decks, on shafts deeper than 100 feet, have shown no movement, he said. Today’s Sodo was built over sediments deposited by Mount Rainier lahars thousands of years ago. Those developed into tideflats where the meandering Duwamish River spilled into a Puget Sound estuary, rich in seafood and surrounded by native villages. By the late 1800s, white entrepreneurs raced to build train tracks on wood pilings, bringing coal and logs to the waterfront. Starting in 1895, a company led by ex-territorial governor Eugene Semple began to dredge and straighten the river — whose bottom sediments were dumped in Sodo. “That part of town, all of it, is fill. I think despite what we do, we are never going to overcome that thousands of years of geologic history in that area,” said David B. Williams, whose 2017 book “Too High & Too Steep” explores Seattle’s regrades and reclamation schemes. To guarantee zero settlement requires spending massive sums of money for more robust foundations, as at Safeco Field and CenturyLink Field, he said. Seattle’s $140 million Lander Street overpass now under construction features columns at least 150 feet underground to reach firm earth. Knowing the settlement risk, WSDOT chose to construct modern Sodo abutments with a lightweight Geofoam interior. Back in 2011, a state engineer said the structure might sink 8 inches if built from heavier, tightly-packed sediments. Sowers said Thursday that the material directly under the damaged area is a combination of sediments and Geofoam — not solely the lightweight Geofoam. He deduced that from the “differential settlement” in which only an edge of the large abutment sagged, not the whole thing. 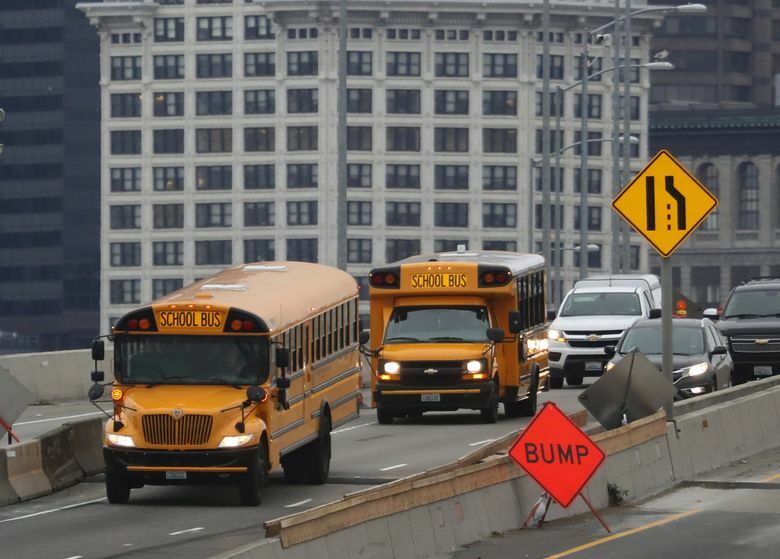 Modifications are underway in the southbound direction by contractor Scarsella Bros., while northbound lanes will be repaired when the Alaskan Way Viaduct permanently closes Jan. 11, said Newborn. If travelers in the area look out the window, they’ll see additional white Geofoam stacked or covered in black tarps near the tunnel portal, where more ramp structures will be completed by late January.